These inspiring quotes will get you fired up for the day! Copy them into your journal, bathroom mirror, office wall…wherever you need an encouraging boost. I spend a lot of time between the pages of my bullet journal. It’s where I organize my schedule, goals, characters I’m working on, ideas I’ve had, lists I don’t want to lose. It is quickly becoming a second home for me, so I strive to make it a positive, enjoyable place to spend my time. One way I accomplish this is by peppering my journal with little notes of encouragement. No matter how the day has worn me down, I can retreat into my bullet journal, refocus, block out the world, and remind myself that mistakes happen, goals take time, and I am enough. These quotes are inspiring on their own, or you can dress them up with doodles and creative lettering. 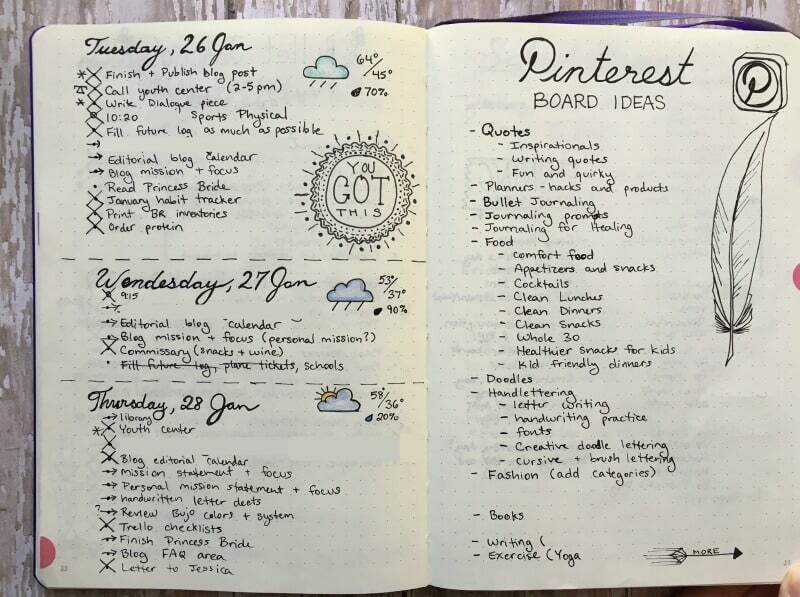 Embellishments are certainly not requirements for bullet journaling (and you don’t want it to become another thing on your to-do list), but I find that visual appeal plays a huge role in how my journal affects my mood. 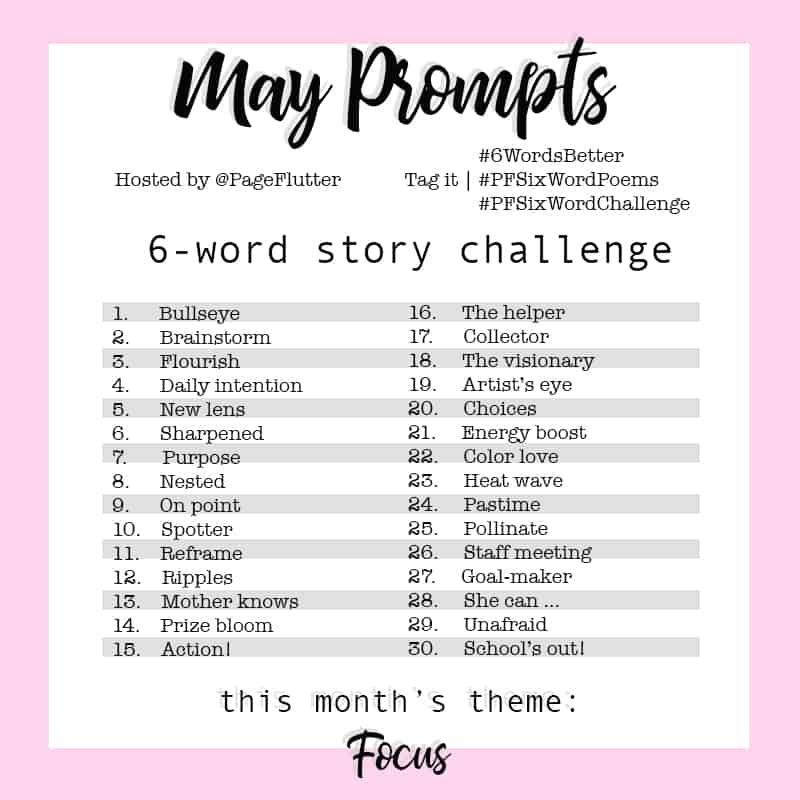 These habits also contribute to my creative free time, a tool I use to inspire my writing. When I’m feeling stuck, a little doodle pause can be just the thing I need to get my creative juices flowing. 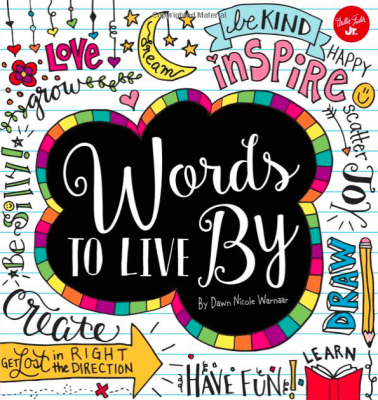 Words to Live By: Creative Hand-lettering, Coloring , and Inspiration by Dawn Nicole Warnaar. Released as of March 1st (still hot off the press), this is the latest book by graphic artist Dawn Nicole. Dawn’s website bydawnnicole.com is packed with hand-lettering & doodling inspiration and techniques. 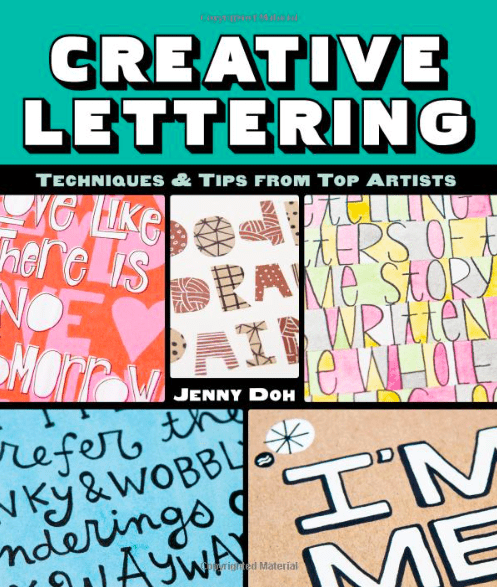 She is unbelievably talented and gives real tips and tutorials for how to accomplish creative lettering. I would buy any book she published (you’ll notice I feature her coloring books in my sidebar). 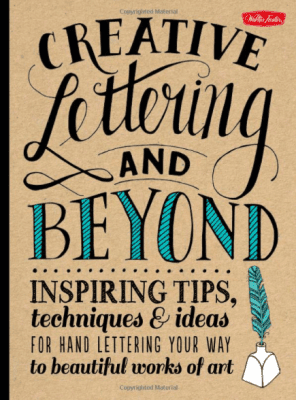 Creative Lettering and Beyond: Inspiring tips, techniques, and ideas for hand lettering your way to beautiful works of art by Gabri Joy Kirkendall, Laura Lavender. 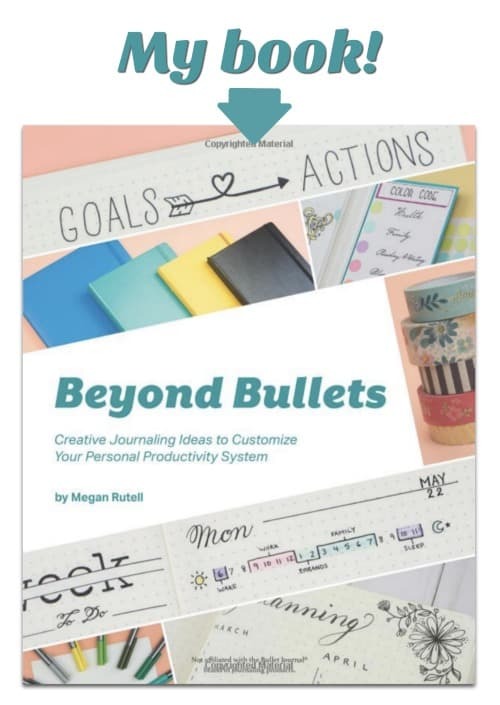 This book is more of a workbook with practice pages and lettering examples. It’s a good way for beginners (like me) to get ideas and try new lettering ideas. 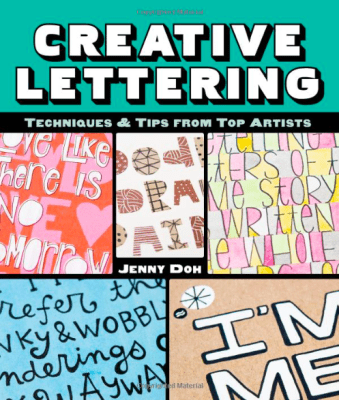 Creative Lettering: Techniques & Tips from Top Artists by Jenny Doh. I have not personally used this book, mainly because I’m still very new to modern calligraphy and hand-lettering. It is a bit more advanced and may help you improve your technique if you’ve moved beyond basic lettering. Even if you’re not the artistic type, you can add some happy words to your journal. 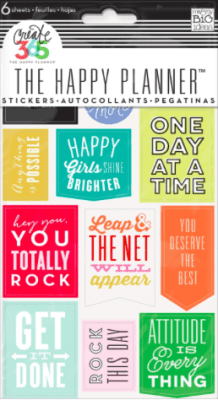 The Happy Planner makes these adorable sticker notes. They add some color and cheer, but they don’t require any extra effort to stay focused on your goals. Now, for the important part: The words! 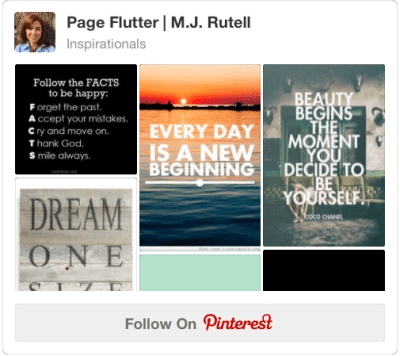 I’ve rounded up 25 (+1) of my favorite positive quotes to feed your journal pages. Be stubborn about your goals. Be flexible about your methods. There will be haters & doubters, and there will be you, proving them wrong. Don’t let someone who gave up on her dreams talk you out of yours. If you are the smartest person in the room, you are in the wrong room. Work hard & stay humble. Imperfection is a form of freedom. Mistakes are the greatest teachers. Life is short. Let’s do this. We cannot control the wind, but we can direct the sail. Happiness is found when we stop comparing ourselves to other people. Stay patient, and trust your journey. +1. Your quote! What encouraging words pop up in your bullet journal? Comment below to share your gems of wisdom with the world. Ohhh! That’s a good one. I’m so glad you enjoyed the post & thanks for sharing your favorite with us! Love quotes! Will definitely be adding some of these to my quote journal. No. 14 and 22 really resonate with me as creativity is my superpower, BFF and saving grace. My favorite quote and mantra that I incorporate in my everyday is “Dwell in Possibility”. Thanks for sharing! I saw a quote recently that really got me. After taking a Myers-Briggs personality test at 16 Personalities (a website), I received a newsletter from them and in the newsletter I saw these words: “don’t stop at the map.” Since I tend to research everything into oblivion, but rarely ever *do* the project I’m researching, you could say I stop at the map quite often, so this quote inspires me. Oh, Crystle, those are such meaningful words for me, too! Action takes a lot of courage. Tracy, the perfect quote to inspire action. I need this one on my coffee cup! Krismiss, these are amazing! I am so grateful that you took the time to copy these here for everyone to see. If there’s one thing I never get enough of, it’s inspiring words. Thank you again! ???? Wow, Debbie, thanks for the link! I’ll have to check it out. So glad you enjoyed the quotes! One of my favorite book quotes of all time! My favorite quote of all-time is at the very start of my journal. It was spoken by the character Galadriel in the Lord of the Rings movies. “Even the smallest person change the course of the future.” I first saw the movies in High School and that quote stuck with me due to my being a shorter person, much like the Hobbit the quote was referencing. I have always remembered it, especially when something seems out of reach. What a beautiful quote, and so true. Thank you for sharing with us, Molly! “Make your Faith Larger that your Fears, and make your Dreams Bigger that your Doubts” Robin Sharma. I had decided that this will be my 2017 quote. 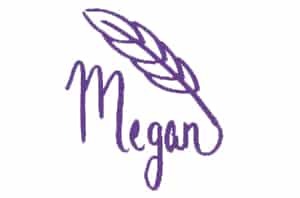 Thanks Megan for creating this fantastic post. Get out of your comfort zone with baby steps!